KDIGO guidelines focus on topics related to the prevention or management of individuals with kidney diseases. Criteria used by KDIGO for topic prioritization include the burden of illness based on prevalence and scope of the condition or clinical problem; amenability of a particular condition to prevention or treatment and expected impact; existence of a body of evidence of sufficient breadth and depth to enable the development of evidence-based guidelines; potential of guidelines to reduce variations in practices, improve health outcomes, or lower treatment costs. 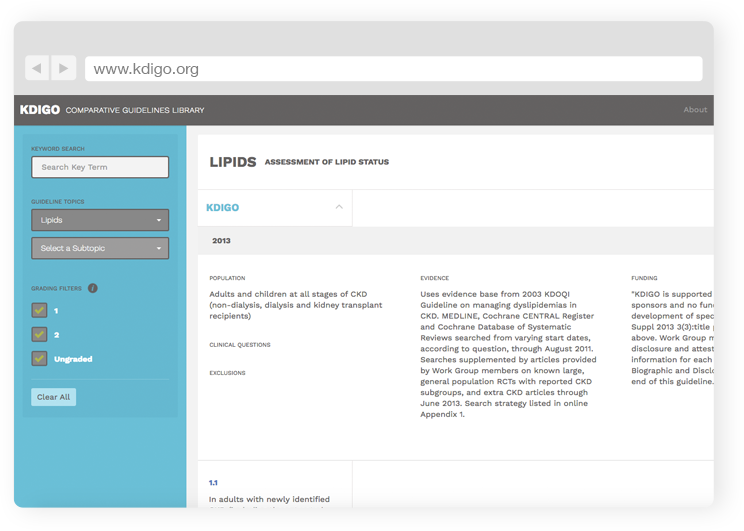 KDIGO Guidelines KDIGO guidelines are created, reviewed, published and implemented following a rigorous scientific process. Interested in providing feedback on KDIGO guidelines before publication? Sign up today to be a KDIGO Guideline Reviewer!